I have been backpacking for over 30 years, all over California, and in many of the western states and Minnesota. I hike year-round, and average 500+ miles (800+ km) per year. I have made a move to lightweight gear, and smaller volume packs. I start early and hike hard so as to enjoy the afternoons exploring. 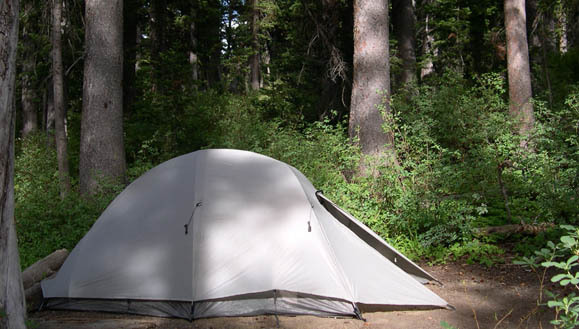 I usually take a freestanding tent and enjoy hot meals at night. If not hiking solo I am usually with my brother-in-law Dave or fianc�e Jenn. Warranty: (quoted from company web site) "100% Guarantee. 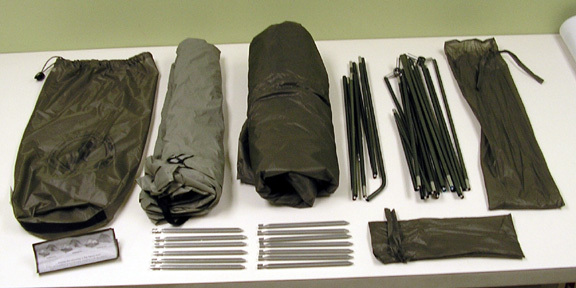 Our number one priority is to make functional and dependable outdoor products. If you are not satisfied with any Big Agnes product at the time you receive it, or if one of our products does not perform to your satisfaction, return it to Big Agnes for a replacement or refund." The Big Agnes Seedhouse Superlight 3 (hereafter called the Seedhouse or tent) is a lightweight three-season tent aimed at the backpacking crowd. Here is a picture of the separate components. Like my Seedhouse SL2 (see review) it uses a hub system with the poles. The main pole has 5 sections of poles that attach to two Y shaped hubs creating an assembly that looks like a stick figure without the head, just the legs body and arms. Or kind of like an X with a straight section in the middle. One end is longer than the other. This goes to the front of the tent. 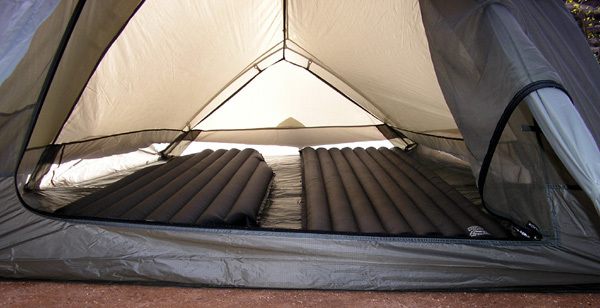 Each pole end goes into a grommet at the corners of the tent body. Once they are secured, the body clips to the poles with nylon hooks. On this model another single pole runs cross-wise at the middle of the tent. This one pulls the sides up creating much more room inside and, as it attaches to the main poles, adds extra support too. The weight of the DAC Featherlite NSL pole system is 1 lb 3.8 oz (0.56 kg) and can be stored in the provided 0.5 oz (14.2 g) sack. Here is a picture of the poles up and just starting to attach the body. As can be seen above the tent has a bath-tub style floor. It is made of 30D nylon rip-stop with a silicone treatment and 1200mm waterproof polyurethane coating. The walls of the Seedhouse (like all of the tents in this series) are made of 20D nylon mesh. The seams of it are reinforced to keep the clips from ripping out. 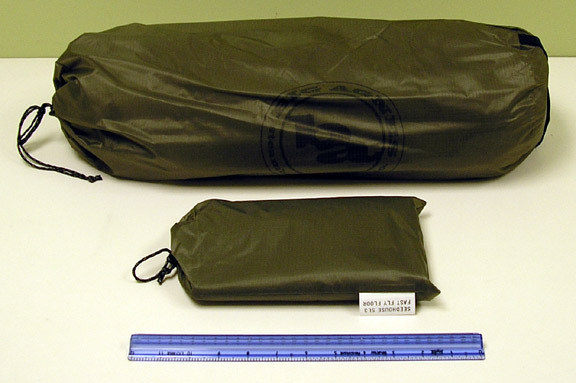 Two small gear pockets made of the same netting are located near the door on either side of the tent. A D-shaped door is positioned at the front of the tent. When facing it from the outside, the left side opens up. There are a couple of loops of fabric and ties to allow the door to be tied open. The lower loop can be seen in the photo above of the open door and the interior of the tent can be seen too. To illustrate the room inside please note that it has two Long size Big Agnes Insulated Aircore pads in side. A third could fit, with all of them touching each other and the sides of the tent. The fly (seen in the first picture above) is made of 20D nylon rip-stop with a silicone treatment and 1200mm waterproof polyurethane coating. All seams of it (and the floor) are factory taped. The fly clips to the tent body by means of straps and buckles at the corners and middle near the ground. The straps can be tightened to pull the fly taut. The front of the fly is stretched away from the body and secured with the use of two stakes creating a very small vestibule. 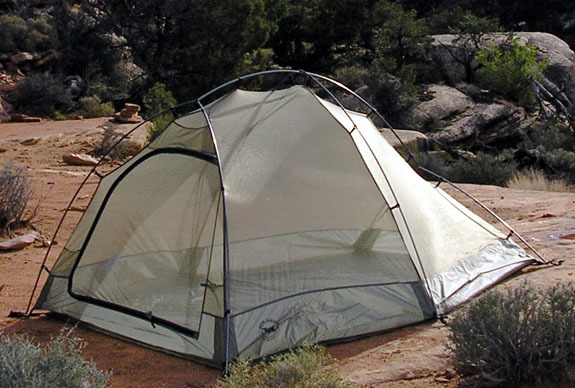 A D-shaped door matches the one on the body allowing access to the tent. It too has tie backs for the door. There are numerous guy-out points on the fly (and netting body) to allow extra support for windy conditions. The tent came with 13 stakes that weigh 0.4 oz (11.3 g) each. (I do not know if they sent me one extra or one too few. Maybe just a baker's dozen�) The stakes are packed in a 0.2 oz (5.7 g) sack. 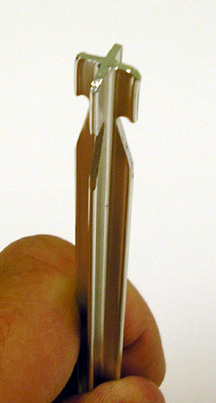 The stakes are made of aluminum with an X-shaped cross-section, as can be seen to the side. A small notch cut into the fins hold the stake loops in place. I have the optional 10.4 oz (295 g) footprint for it. By using the footprint with just the poles and fly in what Big Agnes calls a Fast-fly set-up the weight of the body can be deducted from the total. In this configuration bug protection is non-existent. Here is a picture of it stuffed along with the footprint. 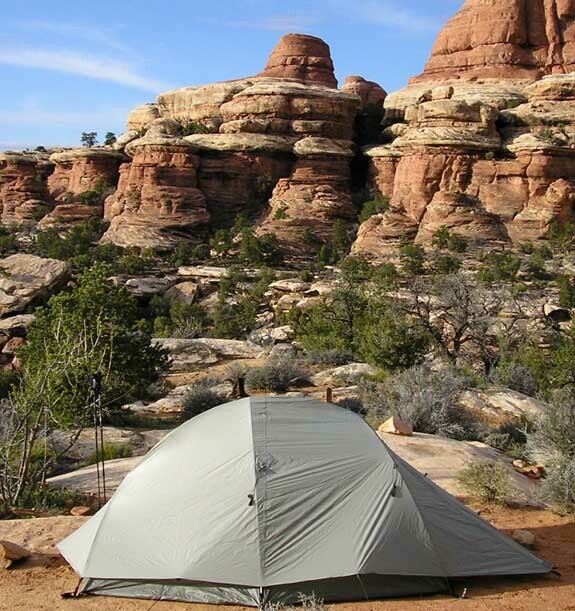 Jenn and I used the Seedhouse 3 SL in Utah's Canyonlands National Park (NP). Camp was at 5400' elevation (1650 m) and temps got down to 35 F (2 C). It was rainy but none fell while the tent was set-up. It was also used by us three nights in Grand Teton National Park (including the picture in Paintbrush canyon below) and one night in Yellowstone NP. Temperatures ranged from 35 to 82 F (2 to 28 C) with no precipitation, and it was set up at elevations ranging from 6700' to 9000' (2040 to 2745 m). All sites were on dirt and some within feet of streams. I used it with Jenn at Cleveland National Forest. We started at the San Juan trailhead, and then took the Bear Canyon trail to the Bear Ridge trail, to the Bluewater Ridge trail to our camping spot at Fisherman Camp. The temps went from a high of 90 F to a low of 55 F (32 - 13 C). We used it on an over-nighter on the Desolation Trail in the Mount Olympus Wilderness, with temps in the low 80s F (29 C) and once in Minnesota with my 7-year old twins that I can not find the field info for. I purchased the SL3 direct from Big Agnes in 2006 primarily to use with my 7-year old twins on their first backpacking trip. After meeting and now hiking with my future wife, I use it as a two-person shelter for the two of us. As I have been using the 2-person version solo since its inception, and the Sarvis also made by Big Agnes (see reviews) I expected to be happy with this choice. I was not disappointed. I love the weight of this tent. It weighs less than many two person tents I have owned and is close to the weight of some solo shelters. 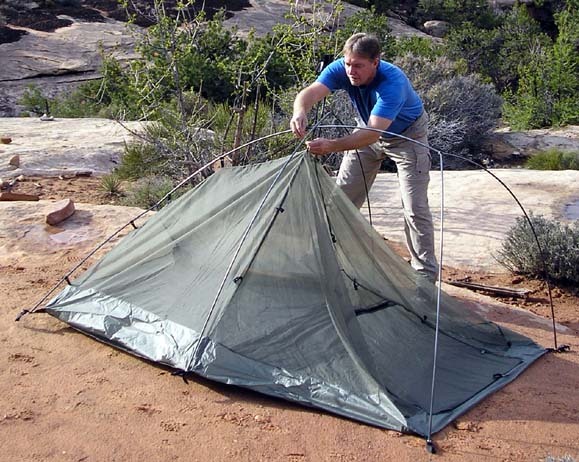 It works very well as a two person shelter for me, the way I usually use it. While I can use it with my children for the three of us, I would not want to try to put three adults of my size in it, (of any size really.) For two it leaves plenty of room to store gear to the sides or center depending on who is sharing the tent with me. It sets up very fast. I can put it up in a few minutes by myself. One problem with set-up though is when it is raining. The rain will go through the walls and be waiting for me in the tent once set-up is complete. I always carry a towel to wipe it out in the case of rain. I usually try to wait for a break in the rain before setting up my tents to avoid this. The vestibule is pretty small. I can cook in it if needed, but have to be extremely careful as it slopes quite steeply down and does not have a lot of clearance for a stacked canister stove and pot. I can store our boots, but there is not really enough room to put packs in it. The ventilation is very good with all of the netting. But I have encountered condensation problems with it still. While backpacking in Utah's Canyonlands, we had so much condensation that the entire inside of the fly was dripping. It was from the completely saturated ground as it had rained heavily during the day. There was so much moisture in the air that my covered pack that was nowhere near us was soaked in the morning, so I can not fault the Seedhouse for the wetness. And wet it was as any wind (or one of us) hitting the sides resulted in a shower of drops hitting the netting and going through it onto us. That is the price I have to pay for the low weight associated with the mesh walls. It is very neat to be able to just use the tent without the fly in mild weather. I just have to remember that there is zero privacy when used in this manner. Here is a pic of it sans fly. In contrast, the trip to Grand Teton saw camp sites that were within 10' (3 m) of streams, and at a time of year that had a lot of snow still standing around. But not one night did we experience any condensation. The foot print was soaked on the bottom, but nothing went through it, nor was there any moisture on the tent floor itself. The trip to Yellowstone saw great ventilation too, with zero condensation. The stakes have proven to be very strong. Sometimes it is hard for me to keep from pounding them too hard when using a rock as a hammer. Yet I have not bent one yet. By contrast my other sets of stakes all have a bent one or two. My only complaint about the stakes is that they are very hard to get back out as there is not much to grab onto to pull them with. My fingers were getting torn up trying to do it by hand. I could slide another stake edge under the notch in one of the fins and pull it up that way, but it slipped quite often. I do not want to pull them up by the tent loops as I worry that I may slice the loop doing so. The zipper in the door works quite well. I have had no problems with it to date. The zipper on the fly though gets caught quite often. It likes to have the fly very taut to work smoothly. Unfortunately that can not always be the case depending on soil types where set up. I especially love the weight of this tent. I can not complain about carrying a 3-person tent that gives me this much room and weighs less than most of my previous 2-man models. The Seedhouse 3 has become my favorite two person shelter, and has even been my tent of choice to use alone for car camping because of its room and speed of set-up. It has proven to be as good of a tent for me with two people as the 2 SL has been as a solo. I look forward to seeing what they come up with in the future for this great line. In the mean time I am happy with this one. Here is a shot of it in Grand Teton National Park at an awesome spot near my favorite rock.